Knorr Demi Glace Sauce gives you the full flavour and aroma of a classic Demi Glace in five minutes. Its dry mix requires no refrigeration and is easy to store for up to 18 months. Knorr Demi Glace is one of the most flavourful ways to enrich your sauces for meat. It is the perfect base for sauces and stews. It's perfect as a base for your mushroom or pepper sauce. Another fantastic application is to dilute the sauce and use as braising liquid for maximum flavor. 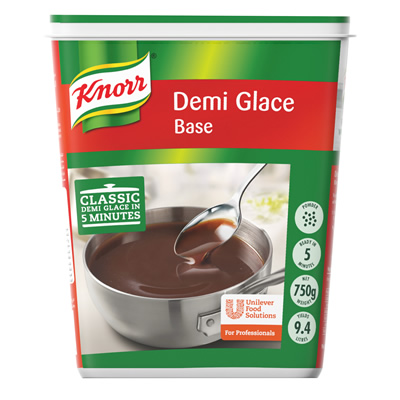 Knorr demi glace prepares effortlessly a thick beef/veal based sauce by adding boiling water, stirring and leaving to simmer.